I don’t know if you’re familiar with the idea of December Daily, but it’s a scrapbooking project that sets out to document daily life during the month of December. I have tried to do this in the past: took pictures of the kids’ advent calendars and what they found inside on a daily basis along with any of the special events that happened in December, e-mailed these images to grandparents, posted them on Facebook, until I tired of trying to get the kids to cooperate and gave up on it. This past Christmas I decided to try and do December Daily again, but focusing on what I love about December instead of focusing on the kids. I journaled about specific things that happened (like me shoveling the driveway and how good it made me feel) as well as general things (like how much I loved the handmade items that were a part of our holiday decorations and traditions.) My project today is the completion of one of my specific journaling days (day 5 – although I believe the event was really on December 4th – it is journaling about that week). To create this page, I used the Mix & Match Simple Stories binders (6″x8″ format) and one of the pages from the Documented collection as my base. I lined the edges with some washi tape (the red is Jolees Papertape and the silver star tape was from the DD kit from Whimsical Twist.) I let the tape hang over the edge so that it would hold the page to my craft mat. I cut an outline of a phone from scrap paper and used repositionable adhesive on the back to keep it in place and then taped the Studio Calico Huey’s bubbles Mask over the top half of the page. I then smeared Golden Gel Mediums Molding Paste into all the openings, moved the mask to the bottom half of the page, taped it down and repeated the process. I removed the misting mask and allowed it to dry a little bit before spritzing with some Smooch Spritz in Green Olive and Sheer Shimmer Spritz in Pewter. I then removed the phone die cut and allowed everything to dry. What my page looked like when I was done. I figured you might something to look at. I trimmed the edges with my craft knife and metal ruler then I patted the page down a bit with a baby wipe to make sure that none of the spray was going to be messy. I used Alpha Stickers from Echo Park’s Dots & Stripes collection for the title along with some Ranger Liquid Pearls in White Opal (for the “to” as well as a few dots here and there on the page.) I used Zip Dry adhesive to glue down the mini silver stars from Whimsical Twist, along with the round flat sequins from Studio Calico’s stars and dots sequin collection. The date tag was created with a cut from Lori Whitlock’s 3×4 December Daily Life Cards 1-15 files (from the Silhouette Store) using DCWV Shimmer Matstack and Echo Park’s 6×6 ’tis the Season paper pad. I will be sealing up the page with Inkssentials Glue n’ Seal gloss finish to make sure things don’t fall off. This is my first attempt at using the Molding Paste and I’m pleased with the results! 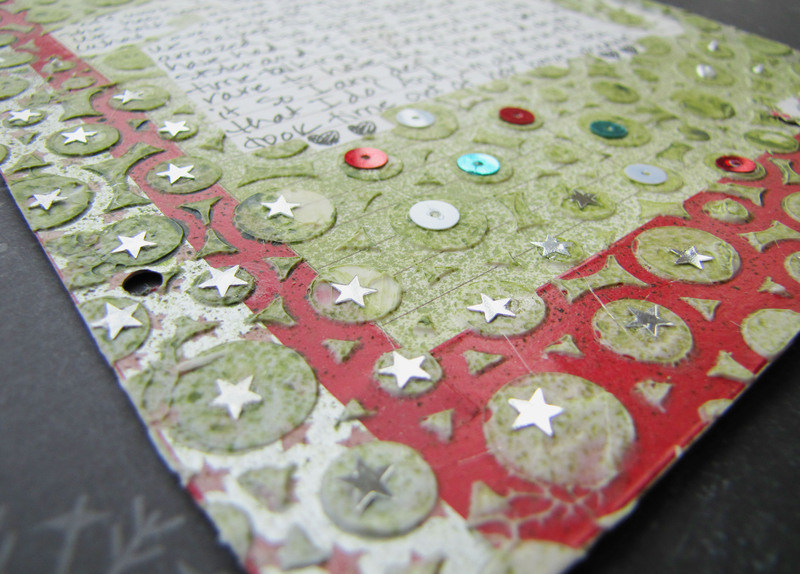 The effect of the sequins and stars on the page is really wonderful, reminding me of a mosaic. I gave this a try because of the Simon Says Stamp Monday Challenge: Paste. I’m so glad I gave it a shot as I love texture and could really get into creating my own templates to get different effects. Thanks so much for bearing with the descriptions. Maybe next time I’ll take the time to photograph my process so there’s more to see along the way. If you have any questions, I’d be happy to try and answer them. Just leave them in the comments. Also any advice or thoughts you might have about this page are welcome! Thanks for stopping by! I hope you have a wonderful day!